Before you even step into a car dealer’s showroom, you can research, find the vehicle you want and seal the price—all online. Getting advice for buying a new car can make you feel like you’re about to enter a minefield. There appears to be a dozen ways a car dealership can rush you into a decision or get you to spend more than you intended. Consumers routinely list buying a car as the worst shopping experience imaginable, Forbes recently reported. So how do you navigate this minefield and get the car you want at a price you can afford? First, by doing your research on the Internet and then working with websites that can help you choose and find the car you desire. By the time you enter the dealership, you’ll have at least evened the playing field. First, go online to check out different cars, models and options. Examine their safety and other ratings, find reviews and get an idea of prices. (See sidebar for what features to research.) Several companies are known for their expertise. Kelley Blue Book. This standard guide since 1926 uses actual transactions to determine car prices for both new and used cars. KBB also lists the car manufacturer's suggested retail price (MSRP) and dealer invoice. The MSRP is the price the manufacturer recommends to the retailer, and the dealer invoice is the amount an auto dealership pays the manufacturer for a vehicle it puts on its lot. These two pieces of information can help you better negotiate the price with the car dealer. The site has reviews from both experts and consumers. J.D. Power. The company has been providing consumer ratings since 1968. Its Power Circle Ratings are based on independent and unbiased feedback from a representative sample of verified product and service owners. On J.D. Power’s website, you can find ratings for a car’s mechanical, feature, accessory, body and interior quality, as well as for performance, creature comforts and style. There's also a score for the dealership experience. Consumer Reports. Known for its independent reviews and advice about all types of products and services, the magazine and website offer extensive advice on purchasing a car. Read about how to choose a type of car, avoid “car-buying surprises,” evaluate and negotiate with the dealership, finance the purchase and finalize the deal. If you subscribe to Consumer Reports, you also have access to its car reviews. While there are some people who might thrive on wheeling and dealing, many car buyers would rather avoid the whole process. There are organizations and businesses, some not necessarily dedicated to car buying, which you’ve dealt with over the years and have come to trust for various reasons. These are just a few. When researching a new (or used) car, what should you look for? Kelley Blue Book offers these suggestions. "Passive safety" precautions include airbags, energy-absorbing crumple zones and mechanisms that can detect an oncoming crash and tighten the seat belt (pretensioners). Other more active safety features include antilock brakes and traction and stability control. If you drive in bad weather or on slippery surfaces, consider getting all-wheel drive or four-wheel drive, which can make driving safer. The National Highway Traffic Safety Administration's Government 5-Star Safety Ratings provides the relative performance levels of various cars and trucks in crashes, and an indication of how your prospective vehicle's safety features compare to those of others. Using research tools like J.D. Power Circle Ratings, check out how your desired car rates in mechanical, feature and accessory quality as well as the quality of the body and interior. Make sure to research ratings for performance, creature comforts and style. Consumer Reports. In addition to offering its own guide to purchasing a vehicle, Consumer Reports has a car-buying service. Using its Build & Buy Car Buying Service (developed with the car-shopping website TrueCar), you can get current price information about the make and model of the vehicle you want. In fact, online you can configure the car of your dreams, choosing the trim, color and options you want. From this information, you’ll get an estimated dealer price from Consumer Reports’ prescreened dealers in your area, plus a certificate guaranteeing you a certain amount of savings from the MSRP on the model you’ve chosen, if it’s in stock. AARP. On AARP’s website, once you select the car model you’re looking for, you can choose the features, including sedan or hatchback, color, the desired mpg, and your price range. The service recommends dealers in your area, which will search local inventory for the car you want and provide pricing on available vehicles that match your preferences. You can then take the price, which is often below MSRP, to the dealer you choose. Be forewarned, though: To use AARP’s service, you must provide your email address and phone number (unlike Consumer Reports, which hides your identity), so be prepared to have dealers contacting you within five minutes of filling out AARP’s forms. AAA. 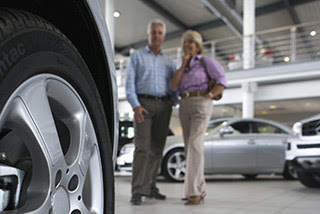 The national car club has its own Auto Buying Program for both a new or pre-owned vehicle. It’s similar to other organizations’ programs, but different regions of the country have slightly different programs. Consult with your local club for details. Costco. Similar to the other programs, the warehouse shopping club uses selected dealers who meet the company’s requirements for value. Costco gives members the resources to “build” and research your car online and prearranges low costs with dealers. The company claims that it continuously monitors its dealers to ensure competitive pricing and good service. United Services Automobile Association. Once you’ve researched and compared prices, you can choose up to three certified dealers for test drives. When you’re ready to make a decision, present the dealer with your USAA Savings Certificate that guarantees the price for the car you've chosen. Edmunds.com. This site won the highest ranking in J.D. Power's 2014 survey of car-shopping sites based on content, ease of navigation, appearance and speed. Find reviews and shop for new and used cars in your area. After you choose a car, view the average price paid and get an estimated price from Edmunds. If you send the dealer your contact information, you can get a locked-in price. TrueCar. Like Edmunds, this site monitors local car sales to determine the average price of a car in your zip code. When you find a car and dealer you like, you can lock in the price with a certificate you take to the dealer. Carvana. Bypassing car dealerships, Carvana has its own inventory of inspected cars for sale. If you live in its service area (in the South), you never have to leave your house. You can do all the car shopping, dealing and financing online, and then wait for Carvana to deliver the car you chose to your house. If you don’t live in its service area, Carvana will pay for your plane ticket (up to $200) to fly and pick it up. Carvana estimates that cutting out the dealers saves buyers $1,500 per car. If you drive the car around for seven days and decide you don’t like it, you get your money back. CarMax. The United States' largest used-car retailer offers no-haggle pricing on its vehicles, meaning the price is the same online as it is on the lot. All of their used vehicles come with a free vehicle history, 5-Day Money-Back Guarantee, and 30-Day Limited Warranty (60-Day CT, MN, and RI; 90-Day in MA, NY, NJ). “How to Buy a New Car,” Consumer Reports. “Fix This: Why Is It So Painful To Buy A New Car?,” May 11, 2016, Forbes. “Best car-buying websites,” June 30, 2014, Fox News.